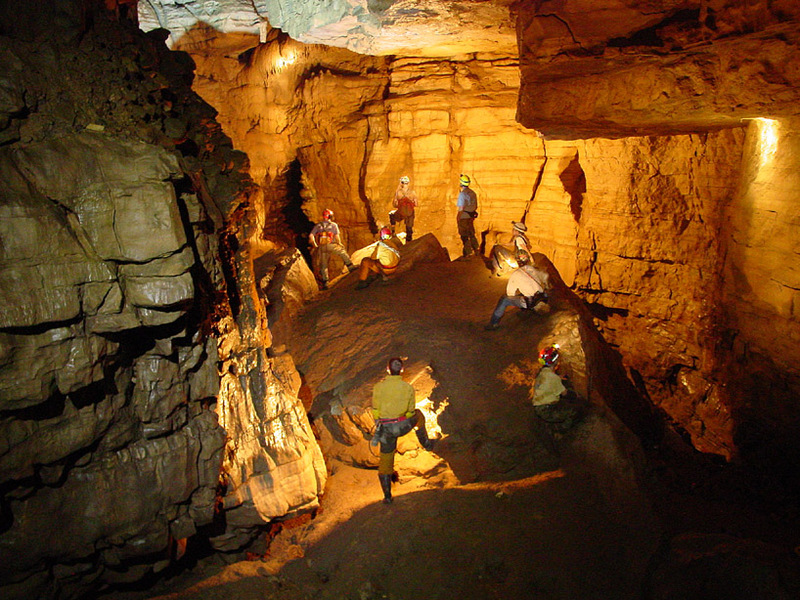 The Tennessee, Alabama, Georgia (TAG) area has long been known for its extensive collection of deep pits and world class dry caving. Some of these classics include Ellison's Cave, which has the deepest vertical pit in North America at 586 feet, Neversink Pit, featured in National Geographic and Camp's Gulf Cave, (see photo bottom page 77) which contains the largest single room in North America. This area is a hotbed of dry caving activity, with new caves being found every month. Curiously, very little cave diving is being done in this area. There are very few large spring entrances, such as those in Florida or the Yucatan, where a diver can easily gain access to the water. Difficult diving conditions are compounded by cold water (between 40 and 60 degrees, depending on location and season) and extremely poor visibility. In addition, landowner relations are very tenuous in many locations, restricting access to many springs and caves that might have good exploration potential. Despite this lack of previous diving activity, there is great potential for the use of cave diving techniques to help extend the limits of exploration in TAG caves. Many of the cave systems have sumps, or areas within the cave where water fills the cave passage, blocking further exploration by dry cavers. Often multiple caves have passages that approach each other, but each passage ends in a sump, preventing the connection of the two cave systems. In other cases there are passages that approach the surface, but end in a sump near to a corresponding spring. Each of these sumps require specialized skills to explore, often much more than the standard spring diver is trained for. What's the different between sumps and springs? The key difference between diving a sump and diving a spring is traversing the dry cave to get to the sump. Often this means long distances spent crawling on hands and knees dragging tanks and equipment behind, or climbing over huge blocks of breakdown with tanks and heavy equipment in bags. Many times there are vertical drops that must be negotiated to get to the sump. 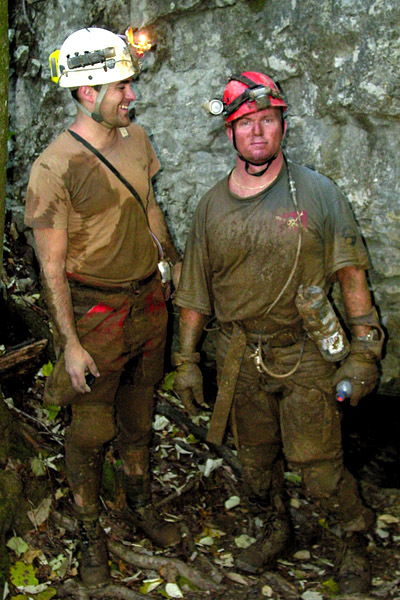 In these cases the sump diver must also be competent in vertical techniques such as rappelling, climbing, using single-rope techniques and rigging and constructing hauling systems for all of the extra equipment. In short, the sump diver must be as competent a dry caver as he is a cave diver. An example of this would be diving the Valkyrie River, a sump deep in the Sistema Purificacion cave system in central Mexico. To support two sump divers, four additional dry cavers were required to help carry wetsuits, tanks, lights, lead and batteries. The trip into the cave took nearly six hours. During that time the cavers had to pass tanks across large pockets in the rock with razor sharp edges, climb between spires of rock down a 60-degree sloped passage and chimney down 60-foot deep cracks while lowering the tanks between each other. Though the dive was only 25 minutes long, the entire trip took over 14 hours. In the end, the sump dive added roughly 300 meters of new passage to the cave system, extending Sistema Purificacion in a completely new direction from any of the dry passage, hinting towards the possibility of huge virgin dry passage on the other side of the sump. What's the difference between sump diving and spring diving equipment? The difference between sump diving and spring diving equipment is fundamental. Spring diving equipment is based on carrying the largest amount of gas possible into the water using large back-mounted or side-mounted steel tanks. But the selection of sump diving equipment is based entirely on the ability of the cavers to carry the tanks through the dry cave to the sump. Tanks more commonly seen for sump diving include small side-mounted tanks, such as aluminum 40s or smaller or high-pressure, light weight, fiber wrapped tanks. The lights used by the diver change as well, from the fragile acrylic canisters with 14 Ah batteries and halogen lights to smaller and more efficient 10W HID lamps and Lithium Ion or Nickel Metal Hydride batteries in PVC canisters. Often no canister light is taken at all and the diver uses the lights mounted on his dry caving helmet to save weight. Comfort in the water also suffers during sump dives. The bulky dry suits common in spring diving are much too heavy to transport to the sump, so thinner drysuits with no underwear or even wetsuits are often worn to save weight. Why sump dive at all? The possibility for extending exploration in dry caves with sump diving is enormous. 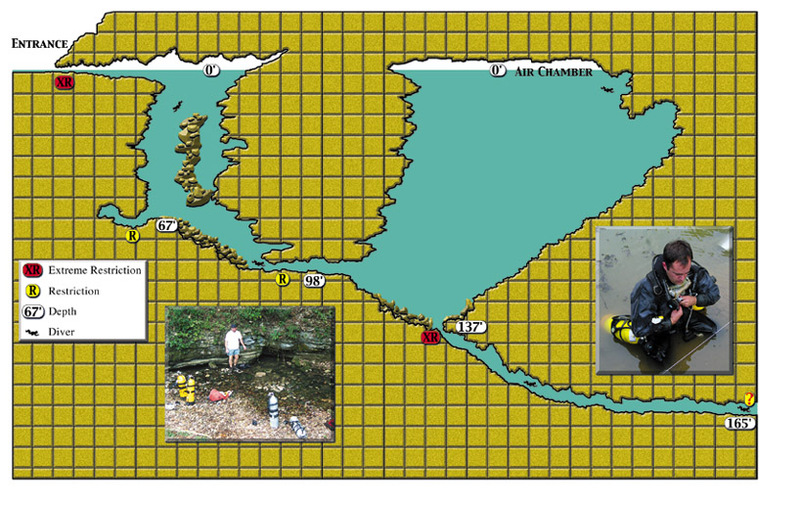 There are numerous systems in TAG and surrounding areas that have never seen sump diving activities, even though previous survey and water flow would indicate large amounts of passage beyond a sump. Some of this is due to the lack of interaction between dry cavers and cave divers. Dry cavers who live in the area are familiar with the sumps in the caves that they have explored. Rarely, however, do these cavers come in contact with someone who has the training and the willingness to haul gear into the cave for what could turn out to be a dead end lead. Not all sump dives end in blind rooms and silt piles. Dry caves such as the world class Sistema Huatla, explored by Bill Stone, have been extended to nearly twice their original length using sump diving techniques. Spring Cave in Colorado had originally ended after a half-mile of knee-deep river passage, until Norm Pace began pushing the first sump, exposing another mile of dry passage before reaching the second sump. Pace has since pushed Spring Cave to five sumps upstream adding even more to the known cave. Cave Without a Name, a commercial cave near San Antonio, Texas also originally sumped after a mile of shallow stream passage. Texas divers crossed the first sump, a shallow pool less than 100 feet long and exposed enough dry cave to double the known length of the cave. Finds like these are everywhere in TAG, waiting for sump divers to explore their secrets. After canceling a trip to the Bahamas due to the recent terrorist attacks, Curt Bowen, Jon Bojar and I traveled to TAG in hopes of locating sumps that could be worked in the short time that we had available. 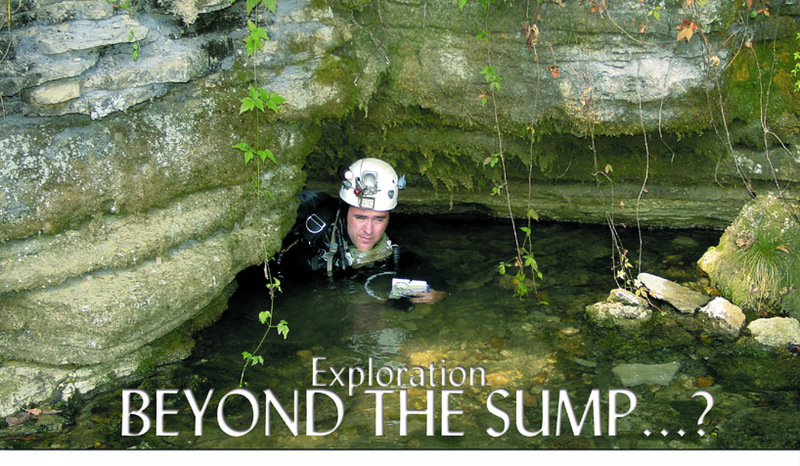 We contacted members of the National Speleological Society (NSS), the national organization of dry cavers, hoping that someone would be able to shed some light on sumps that needed to be explored. We met up with Jeff Parnell and Vern Benke from Adventure Technologies in Murpreesboro who gave us some suggestions and talked with landowners to secure permission to dive on the property. Snail Shell Cave is one of the larger caves in central Tennessee with primarily dry passage and some stream passage. At the furthest east extent of the cave, several passages end in sumps, none of which have been dove. At the surface approximately two kilometers away, there is a major resurgence or spring flow that has been dye traced from the cave, but never physically connected. We secured permission from the landowner to dive the resurgence, in an attempt to reconnoiter the entrance for possible connection to the rest of the cave. Upon arriving at the resurgence, we were greeted by a pool of nearly stagnant murky brown water with a small stream exiting from one side. The visibility turned out to be no more than three to five inches, mainly due to suspended particulate. Only one dive was made, placing 350 feet of line in moderate size passage blocked by immense logs and stumps washed in from an upstream sinkhole and forced by powerful water flow during heavy rains down the passage. The dive was turned after becoming stuck in a small side passage that was indistinguishable from the main passage in the low viz. 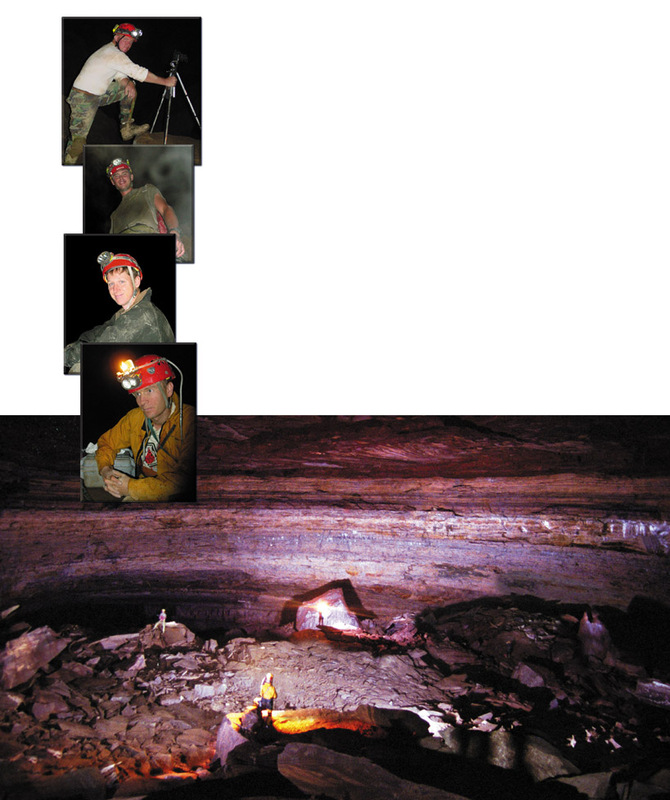 Group of dry cavers assist in lighting up a cave passage in the TAG area. Big Spring is a small road-side cave that flows water out of a crack in a limestone outcropping. At the time we were there, the entrance was passable without having to get completely underwater. The main passage leads around a corner to the first room, where the floor drops out to a debris pile at around 80 feet. Previous divers had left a line and reel hanging from an old bolt in the wall, but had apparently stopped in this first room due to either particulate or generally low visibility. Jon Bojar and Curt Bowen pushed a small passage off this first room to a depth of 91 feet, which led to yet another shaft room, where the floor dropped off to 145 feet. At this point the floor of the shaft tapered into a small restriction blocked by bedrock, which they were unable to pass. I went on a second dive to inspect the crack, and with one sidemount 40 cubic foot tank held in front of me, was able to pass through the crack. The passage below dropped to 165 feet and continued. I tied off my line when I came to thirds on gas, with the passage going strong. Further discussion with the local cavers established that we were headed towards a cave system further up the ridge that nobody had ever considered connecting with a water resurgence. As in the two caves described here, there are plenty of caves in the TAG area that are ready for competent explorers who are willing to haul gear and hone up their dry caving skills. All it takes is a lot of motivation, some dry caving experience and the willingness to put yourself through extended pain and suffering for the possibility of a new discovery.